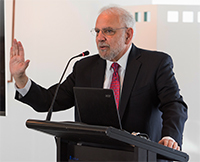 As part of this year’s Dementia Awareness Month, Dementia Australia hosted world-renowned dementia expert Dr Steven Sabat, Professor Emeritus of Psychology at Georgetown University, USA. Dr Sabat spoke at the Parliamentary Friends of Dementia event at Parliament House in Canberra to raise awareness of dementia among policy makers and politicians. Dr Sabat’s presentation described dementia as “memory dysfunction rather than memory loss” and he demonstrated this through his discussion of the different types of memory, which are explicit memory and implicit memory. Compassion was at the core of Dr Sabat’s message. He emphasised that how we treat people living with dementia can enable them to both feel and function better, and can help them to build their confidence. He sought to educate parliamentarians and help them understand that when recall memory fails, it may be possible to access recognition memory and achieve communication, and after all, the personhood of someone living with dementia remains, and they deserve the same respect as everyone else.